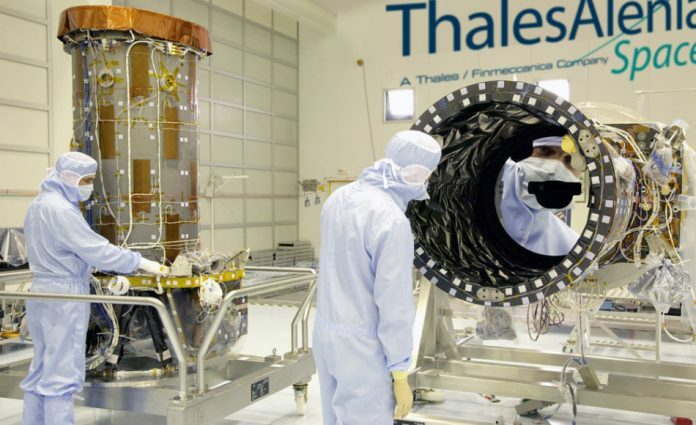 The Agency for the Safety of Air Navigation in Africa and Madagascar (ASECNA) signed a contract with Thales Alenia Space on Feb. 8 in Dakar, Senegal to conduct a preliminary design study (phase B) for its program to develop a Satellite-Based Augmentation System (SBAS). ASECNA’s SBAS is based on European Geostationary Navigation Overlay Service (EGNOS). In line with the agency’s strategic plan, it aims to enhance navigation and surveillance operations during all flight phases, as well as significantly and sustainably improve flight safety and efficiency in the areas under its responsibility. The Agency for Aerial Navigation Safety in Africa and Madagascar is an air traffic control agency based in Dakar, Senegal. It manages 16.1 million square kilometres of airspace (1.5 times the size of Europe) covering six Flight Information Regions (FIRs) – Antananarivo, Brazzaville, Dakar Oceanic and Terrestrial, Niamey and N’Djamena. ASECNA Air Traffic Control centres are based at international airports in each of these cities. According to Article 2 of the Dakar Convention, this agency is responsible for the design, implementation and management of facilities and services relating to the transmission of technical information and traffic, aircraft guidance, air traffic control, flight information, forecasting and reporting to the meteorological department, about traffic routes when it comes to approaching and landing on Community airports. Starting in 2021-22, these services aim to improve the positioning performance of existing satellite navigation systems, such as Global Positioning System (GPS) or Galileo. The new system will help improve precision (down to within a meter), integrity, availability, and continuity for safety-related applications. Other business sectors, including maritime, rail and road transport, as well as agriculture, could benefit from these services. The phase B study should enable countries belonging to ASECNA to define the best system architecture to support the delivery of SBAS services, and to ensure transparency during the following development, deployment and operational phases. The study is being financed by a grant from the EU-Africa Infrastructure Trust Fund (EU-AITF), through a financing agreement with the French Development Agency (AFD). The European Commission and European Global Navigation Satellite System Agency (GSA) will provide technical assistance as part of an international agreement between ASECNA and the European Union (EU), also including the French Space Agency (CNES). This is coming about 2 months after Thales Alenia Space signed a Cooperative Agreement with NIGCOMSAT on SBAS Test bed Demonstration to characterize and validate the performance of NIGCOMSAT-1R navigation band payload with service trials and thus creating a common technical stream for a unified and holistic SBAS infrastructure to fill up the hiatus in Augmentation System for African continent and surrounding oceans (Atlantic and Indian). Next articleOn Why You Should Consider Studying Space Technology For Risk And Disaster Management.